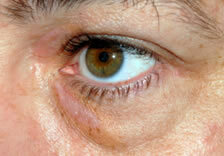 Eyelid/facial lumps and bumps (lesions) are common in patients referred to oculoplastic surgeons. Many lesions can be readily diagnosed on the basis of their clinical examination characteristics alone e.g. 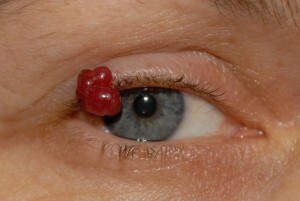 a chalazion (or meibomian cyst). 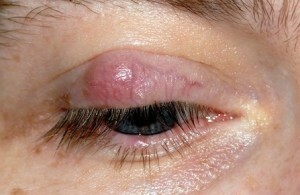 A chalazion (meibomian cyst) and a stye are two very similar lumps that can affect the upper or lower eyelids. A chalazion is a blocked up, inflamed meibomian gland. It is an inflammatory lesion and not an infection. It is not a stye (which is an infection of an eyelash follicle). Meibomian glands are located in your eyelids. They produce an oily secretion which slows the evaporation of your tear film from the surface of your eye in between blinks. 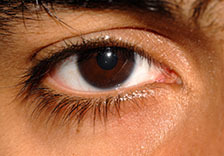 The glands have tiny pin-point openings along the length of your eyelids, just behind the line of your eyelashes. Sometimes a meibomian gland opening gets blocked up. It begins to swell and may rarely become infected. 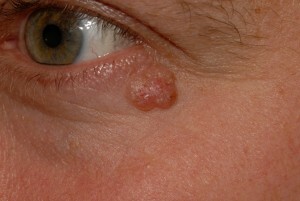 The swelling then subsides, often leaving a firm lump. Untreated the process tends to repeat itself. 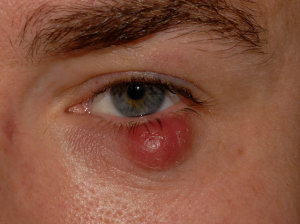 A chalazion or meibomian cyst is treated with antibiotic ointment to prevent a secondary infection, the application of heat treatment and gentle massage towards the eye after applying the antibiotic. 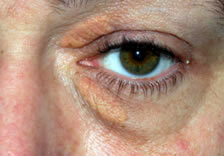 If the chalazion persists, it can be removed by means of a procedure referred to as an incision and curettage (I+C). This is usually done under local anaesthesia in adults, on a day case basis. 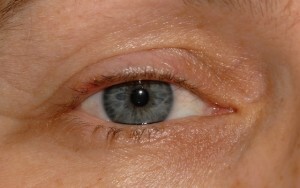 A local anaesthetic injection is given just under the skin of the eyelid. 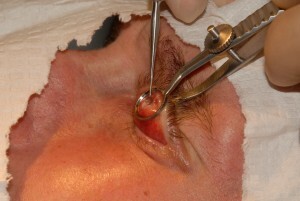 A special clamp is placed around the cyst to protect the eye and to prevent bleeding. 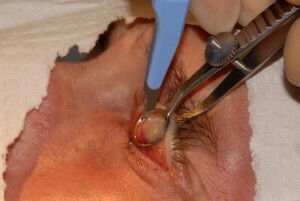 The clamp is used to evert the eyelid so that the incision is made on the inside of the eyelid, avoiding a visible scar. The contents of the cyst are curetted out and the clamp removed. Antibiotic ointment is instilled into the eye and an eye patch is placed. You are instructed to remove the patch the following day after thoroughly washing your hands. You then clean the eye with cotton wool and sterile saline or with cool boiled water. You then instil antibiotic ointment into the eye 3 times a day for 5 days. A chalazion may recur. If blepharitis is the underlying cause, it is important to keep this under good control. This treatment is undertaken in clinic under local anaesthesia for most adults. For anxious patients sedation (‘twilight anaesthesia’) can be arranged. If you would like to watch a video of a patient undergoing this treatment at Face & Eye please click here. 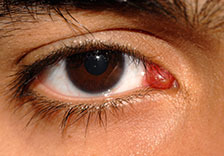 A stye is an infection of an eyelash follicle. It resembles a yellow-headed spot. What is the Treatment for a Stye? Antibiotic ointment is usually sufficient to get rid of a stye and this prevents it spreading to other eyelashes. In most cases there is no special cause but diabetes as a possible cause should be excluded and this is easily done by testing a blood or urine sample at your GP practice. Why Do People Get a Chalazion or a Stye? Sometimes these problems can be recurrent. People with blepharitis are especially susceptible. Blepharitis can be caused by certain skin complaints, such as rosacea, seborrhoeic dermatitis and dandruff. A number of other lesions can be readily diagnosed by clinical examination alone. The main goal in the evaluation of these lesions is to differentiate malignant from benign lesions. In general, the majority of malignant tumours affecting the eyelids and periocular area are slowly enlarging, destructive lesions that distort or frankly destroy eyelid anatomy. There are a number of subtle features that can help to differentiate malignant from benign eyelid tumours. Some malignant lesions, however, may appear innocuous. Conversely some benign lesions may appear sinister. 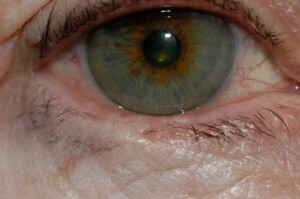 For this reason it can be extremely difficult to make the correct diagnosis of an eyelid lesion without a biopsy. For small lesions an excisional biopsy (the whole lesion is removed) serves two functions: diagnosis and treatment. For larger lesions an incisional biopsy (only a small piece of the lesion is removed) is undertaken for diagnostic purposes. The lesion is then treated appropriately on the basis of the histopathology report. You will visit the clinic a few days or weeks before the date of your surgery to have a preoperative consultation with me. In addition to examining the lesion(s) we will ask you questions about your current and past health, and we will need to know about any allergies you may have, medications you are taking (including over the counter products e.g. Aspirin, Indomethacin, Voltarol, Ibuprofen, Diclofenac, and whether or not you smoke. The surgery is usually performed under local anaesthesia (a tiny needle is inserted in the skin around the lesion and local anaesthetic solution is injected). For patients who are anxious a light sedative can be given intravenously by an anaesthetist. This acts very quickly but also wears off very quickly after the surgery. For patients who are very anxious about surgery around their eyes a very short general anaesthetic can be arranged in hospital. If you are unsure of the names of any medications, bring them with you. You will be told whether or not to stop any medications at this preoperative clinic visit. For example, if you are taking aspirin-containing medicines or anticoagulants, they may need to be temporarily withdrawn or reduced in dose for two weeks before the procedure. This will need to be discussed with your GP to ensure that it is safe to withdraw these medications for your surgery. If you can, try to stop smoking at least six to eight weeks prior to surgery. Your vision in each eye is measured. Your eyes are also examined carefully. Photographs of the lesion may be taken for documentation. Some insurance companies insist on this. Minor surgical procedures are performed as day cases. You should be able to undergo the procedure and be discharged within an hour. You must not drive on the same day. What happen after the surgery? If you have undergone a biopsy the report will be sent to you and to your GP as soon as it has been received from the pathologist. If the lesion is benign and there are no problems you will not need to return to the clinic for a check but in the event of any problems you should call the clinic and arrange a further appointment. Conscious sedation, also known as “twilight anaesthesia”, is a type of anaesthesia which is preferred by many patients for most of our surgical procedures. It is a very comfortable and gentle type of anaesthesia which is safer and far less invasive than general anaesthesia but at the same time highly effective. It is also of advantage for very nervous or anxious patients undergoing quite minor procedures. Typically patients sleep most of the way through their procedure and have no or very little recollection of it at all. You are looked after throughout the procedure by a specialist consultant anesthetist who has many years of experience of this type of anaesthesia, so that your surgeon can concentrate fully on your operation. Shortly before moving to the operating room, a small tube (cannula) is placed into a vein in the back of your hand by the consultant anesthetist and the anesthetic drug is given through that. This is Propofol, a drug which is also used for general anaesthesia but, for conscious sedation, much lower doses are used. With conscious sedation there is no breathing tube or breathing machine, just a gentle flow of oxygen given through a plastic tube within a soft sponge protector inserted into one of your nostrils. Once the sedation has been commenced a local anesthetic solution (a mixture of Marcaine and Lignocaine) is injected into the operative area to ensure a painless procedure. Typical side effects of general anaesthesia including a sore throat and nausea are avoided. Waking up takes only a few minutes at the completion of the surgery and is usually free of any “grogginess.” This type of anaesthesia has been used safely and successfully for our surgical procedures for over 20 years. Xanthelasmata (yellow fat deposits in the inner aspect of the eyelid skin) before and after the application of 90 % TCA (trichloroacetic acid). This is preferable to surgical excision except for very large thick deposits. To learn more about Eyelid Lumps & Lesions, please contact us at today to schedule an appointment.